After my second son was born in early 2004, the rest of that year seemed like a blur. I do, however, remember the trip to Brooklyn to El Viejo Yayo #2. And after re-reading what I wrote below, my exhaustion was evident and probably colored my less than enthusiastic response to our experience there. It was tough; only the group of gluttonous gourmands could get me out for my first nocturnal venture since the birth of my second son, but out I staggered, on very little sleep, to Brooklyn, destination: El Viejo Yayo #2 (bonus points for anyone who knows what a “yayo” is). This was Rick’s choice and, based on our Tandoori Hut experience, we were hoping history would repeat itself and that an inside tip, in this case a Latin restaurant recommendation from one of his Hispanic co-workers, would lead to a restaurant scoop. 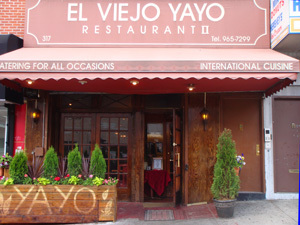 Yayo 2 was in Park Slope Brooklyn in the increasingly trendy locale of 5th Avenue. But this was no trendy place. With the exception of the adornment of well-fed fish in a large fish tank, Yayo 2 was a simple, clean, relatively spacious, Dominican slanted, Latin restaurant. We were all able to assemble for this one and there was plenty of room for us. The meringue music was playing continuously and there was baseball (albeit exhibition baseball) on the television. The ambitious menu boasted not only Dominican specialties such as chicharron de pollo and an assortment of steaks and stews; it also had an “Italian corner” and a “Mexican corner.” All of us wisely stayed away from those corners and stuck to the Dominican dishes. Unlike my local Dominican restaurant, El Malecon, Yayo 2 offered a selection of mofongos; double-fried tostones, stuffed with garlic, onions and pork cracklings, shaped into a cup and mixed with an assortment of meats and seasonings. To start we ordered two; one with pork chunks and another with sausage. They came to the table almost immediately and whether it was the density of the food along with the Presidente beer or whether it was my exhaustion, I was practically done before getting started. But the Yayo steak I ordered was soon to come and I was curious to sample Zio’s “horse steak Yayo style” as well as Gerry’s kingfish, Rick’s barbecue ribs, and Charlie’s chicken stew. The way he was protectively hunched over his fish, I knew better than to think I would get a nibble of Eugene’s fried tilapia. 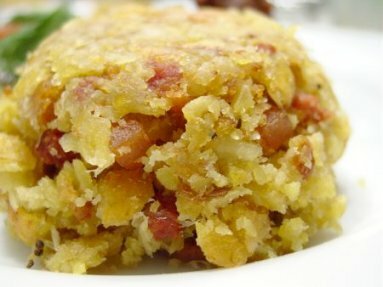 Mofongo: The beginning of the end. Soon my Yayo steak appeared; a slab of flattened, charred beef covered with onions and accompanied with a monstrous portion of yellow rice and red beans. Looking at the bounty in front of me, I knew I was in trouble. With the mofongo now anchored heavy in my gut, I began to labor my way through the tough, dry steak and pile of rice and beans. It didn’t help that opposite me I had to watch Zio heartily devour his horse steak—don’t worry, no ponies were harmed in production of Zio’s dinner. The steak was identical to mine, but covered with two eggs—over easy. I did sample a bit of Gerry’s kingfish, and Charlie’s chicken stew, but I couldn’t get myself to touch one of Rick’s ordinary-looking, and in his opinion ordinary-tasting, ribs. I was done; and to the surprise of the others, with half the slab of meat still on my plate. Well, at least I thought I was done. I just couldn’t resist a tropical dessert and opted for the coconut pudding. A good choice, but not as good as the excellent flan I sampled from Gerry’s order. As we left the restaurant having just barely met our $20 minimum, my stomach was beginning to misbehave. I do not blame Yayo #2 for this; exhaustion can do strange things to your body. But with the exception of the mofongo, which I very much liked despite its plaque inducing ingredients, and the desserts, Yayo #2 was a disappointment and not in the league of El Malecon in quality or value. Insider tips can be tricky; the insider might have an acquired taste for flattened, charred slabs of beef. You just never know. Despite how I felt the rest of the night, within 24 hours of the Yayo #2 experience, I was, I’m proud to say, able to regain my usual voracious appetite. My son, the one mentioned being born just a few weeks before we visited El Viejo Yayo #2, will turn seven in a little over a month. Why does it feel then, like I was just there? And he was just a baby. Okay, that’s as deep as you’ll get me to go here. I’ve not returned to El Viejo Yayo but from what I’ve gathered on the internet, it has not changed much. There is still a number one (36 Fifth Avenue, Brooklyn) and a number 2, the one we experienced. 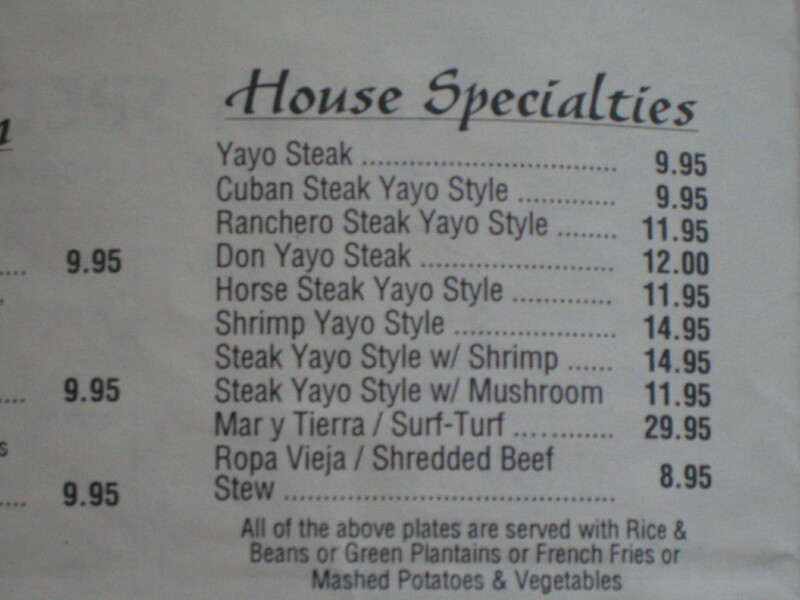 It now has a website (www.elviejoyayo.com) and the menu, with a few minor deletions and additions, and, of course price increases due to inflation, has remained the same though El Viejo Yayo #1 seems a bit more stylish and doesn’t have the noted Italian or Mexican corners.